I have never seen this patch before. 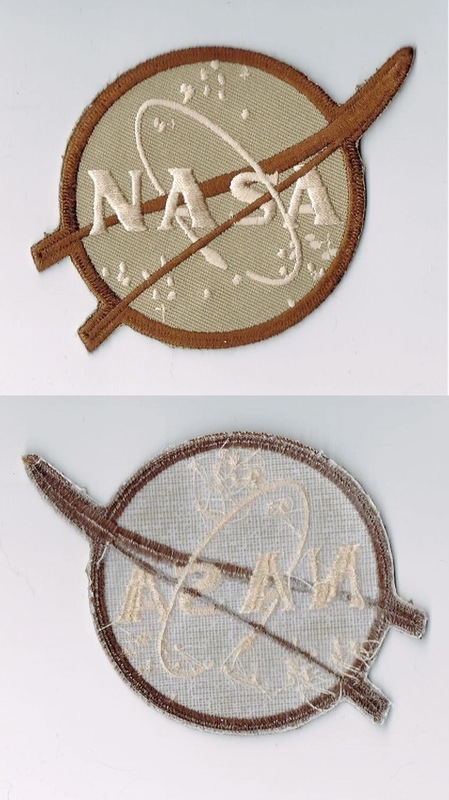 A book on the NACA/NASA patches from NASA says it was for NASA personnel in the Middle East. Has anyone seen this before? EDIT: Okay, I just found this version through Military Uniform Supply, Inc.
Don't think it's made by AB Emblem. 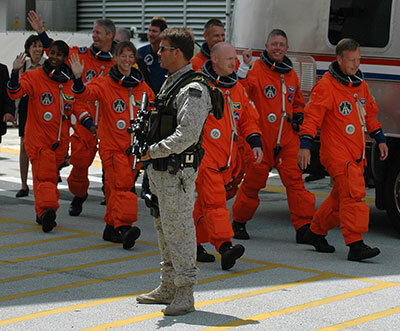 I have one of these, as pictured, from around the time of the 2005 STS-114 mission. 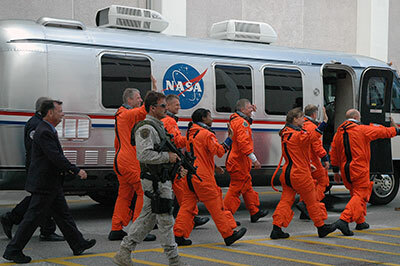 They were worn by the members of the SWAT team that guarded the shuttle crew as they exited the O&C Building at Kennedy Space Center and boarded the AstroVan. That would make sense because military/police applications often call for subdued patches depending on the uniform. There is a large difference between "subdued" and "desert/tan" military patches. I have two of them, recently given to me from a NASA pal of mine who was at Armstrong for a couple of weeks recently. He wasn't 100% sure of the use, said one of the people he was working with had a box of them and was handing them to anyone who wanted one. I ordered one from the Uniform Supply store I mentioned above. I will post a photo when I get it. The "S" in NASA is considerably shorter than the "N" and the two "A's". Weird. I received the patch yesterday. It is a really interesting addition to my NASA logo patches. If SWAT or SRT was wearing these camo things it had to be recently. In the early days they did not. Here are a couple of my shots from the STS-121 walkout. 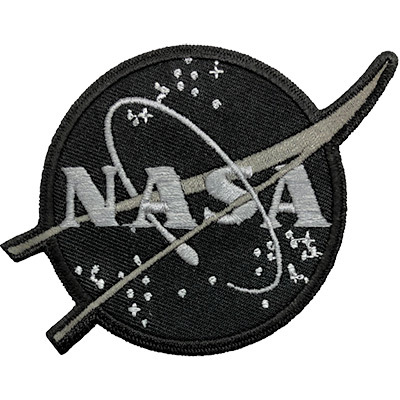 Unfortunately, they don't show the NASA logo patch, but do show why this version could fit with the outfit. The NASA ebook, "Emblems of Exploration" that I found the original photo from did mention Middle East, on page 114. But, I can't find anything about NASA Personnel in that theater. For example, deployments to the Middle East have led to modifications of the standard meatball patch. In one application, crews of the NASA WB-57F aircraft flying over Afghanistan had special “desert meatball” patches made that blended with their flight suits. In addition, NASA aircraft flying in those areas do not carry markings. Subdued tan patches were also simply popular in the early and mid 00's as a sort of "support the troops" sense of feeling. A lot subdued versions of regular patches were privately made and sold in that period. 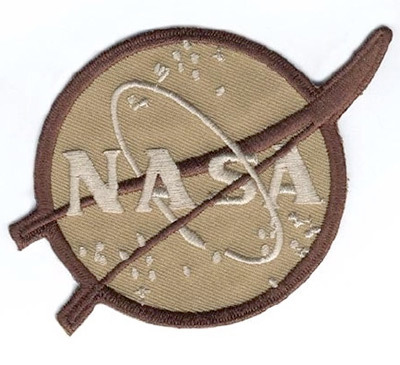 Camo NASA patches are clearly used by security forces, look at this one in woodland camo. But, I can't find anything about NASA Personnel in that theater. I asked my friend who got me the two I have and he said he was told that ER-2 people use these patches on occasion as well as some of the ground support people for various applications. He didn't find anything to support that the security people wore them and was specific that he never saw anyone wearing them when he was there a few months ago. The two that I have in my collection have Velcro sewn to the back of them. ...look at this one in woodland camo. Now that is another patch I need to find! The two that I have in my collection have Velcro sewn to the back of them. Is your patch the same as the ones above? Subdued NASA vector sample, black twill and two colours of grey. Logo measures 3" diameter (not including the vector). No production run was made. Limited quantity. 25 patches were available from their "Lost in Space" website page. The SKU patch design number is 409051 (April 2019 number). 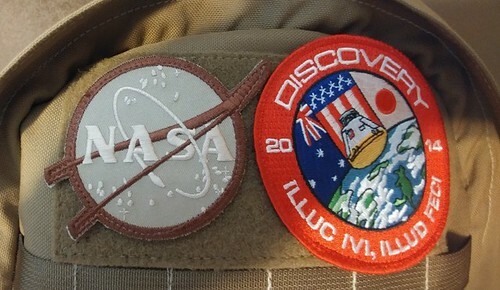 The date code on these patches is 0402 55, which relates to April 2002 — which is an error? It should read 0419 55 to be correct. Update: Now all 25 patches are sold out after just 18 hours on sale. Thanks for heads up Kevin. Managed to snag one last night. Interesting addition to my Meatball collection. Yes, thank you Kevin. Snagged one as well. New to collecting the Vectors but would like begin that process. If anyone knows a source for the desert tan version or similar please let me know. I found one here, which looks good. Here's mine on the left, the one with Velcro attached to the back (it's been on my camera bag, made by Tactical Taylor, ever since). Sweet, Thanks. I looked on Amazon and couldn't find one. You must have the touch.